Earrings There are 14 products. 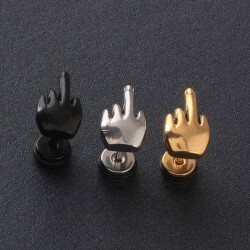 Middle finger men's earrings. Material: stainless steel. Finger length: 8 * 13.5 * 4mm. Please select a color. Simple stud earrings unisex. Material: stainless steel, black plating. Please select a size. Colorful dumbbells earrings, unisex. Material: stainless steel. Size: 13 * 4mm. Weight: 1.1g. Quantity: 5 pairs. Simple round earrings unisex. Material: stainless steel. Please select a size. 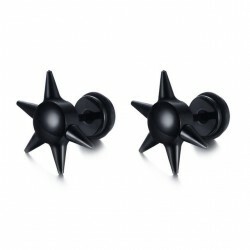 Black nail stud earrings unisex. Material: stainless steel, black plating. Diameter: 13mm. Weight: 3g. Masonic sign silver earrings unisex. Material: stainless steel. Size: 7 * 13mm. Weight: 6.8g. Silver hoops earrings unisex. Material: stainless steel. Size: 6 * 13.5mm. Weight: 5.7g. Dragon stud earrings unisex. Material: stainless steel. Length: 24mm. Weight: 3.6g. 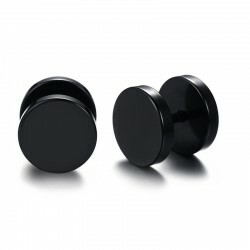 Black & silver earrings unisex. Material: stainless steel. Size: 4 * 15mm. Weight: 3.2g. Quantity: 2 pairs. Unisex vintage earrings. Material: alloy, ancient silver, wood. Diameter: 10mm. Weight: 2.8g. Please select a type. 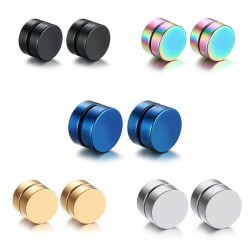 Men's magnetic earrings. Material: stainless steel, black plating. With 2 extra enhance magnets. Size: 8 * 6mm. Weight: 4.5g. Quantity: 5 pair. 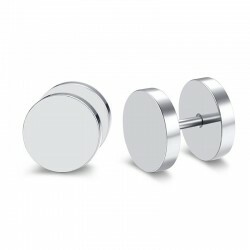 Round dumbbell, men's earrings. Material: stainless steel. Size: 10 * 8cm. Weight: 3.6g. Please select a color.